So, I should have written this days ago, but here we go. Last day. Mount Vernon, Smithsonian’s, and then pack up and saw goodbye. Mount Vernon was a blast. We basically had to spilt up in two groups to get everyone where they needed. We had a good time there and then made the trip back to the bus. After the bus, we went to the Smithsonian’s and gave the kids a choice between the Air and Space and American History. Most hit both pretty fast and had a good time. Bus #2 (Hafner, Norris, and Sims) loaded up and said goodbye. But where was Clift? He caught up with them, told them goodbye, and they made it home safely. Bus #2 loaded up at 4:15, and Tim told them goodbye and they headed out. They made it home safely. This was a fantastic group. I can't properly describe how good the kids were, how fantastic and fun the adults were, and how fantastic the tour guides were. Tim and Clift rocked! Also, a shout out to Rich, Suzanne, and the lovely Jill (who I meet Friday) for all the work to make this happen. A++++ all the way around. After the kids left, Tim made sure I got back to the hotel. I made a 6 mile mistake and walked up Bladensburg about 10 PM. Not my best move. Got back, loaded the train the next morning, (thanks to Clift for getting me there), and headed to Newport News. Sunday, my buddies Jason, Joe, and I went to Jamestown, Williamsburg, and Battlefield Yorktown. Pretty cool stuff. Virginia is for history lovers. Checking these out for future D.C. side trips. It seems so long ago, and yet it was just yesterday. Morning, Breakfast, wake up and get going. Hop on the buses and head out to Gettysburg. This was our first trip to Gettysburg as a group on the Hillwood D.C. trip. I noticed everyone was dragging after being out so late every night this week. We arrived at Gettysburg, check out the musesum and a video and then got on the buses and did a hybrid bus/walk tour of the battlefield. The kids took lots of photos and heard lots of stories. I guess my hope and prayer would be, that if they become a big history guy someday, they’ll be able to vividly remember what saw as they are read. The bus ride back, I was out for the count and it sounds like most of the kids and adults were also. Traffic, rain, and we headed out to Hamburger Hamlet for dinner. After dinner we got some kick balls and did a great BUS #1 vs Bus #2 kickball game. Bus one, Won. Mr. Norris will say it was rigged, but he was wrong. I had a better (taller) vantage point. It was pretty cool watching them play around the Washington Monument. Flags in the background, in the heart of D.C., the kids had a blast. After that we took them to Historic Georgetown and let them walk around and check out that neat part of D.C. They shop, grabbed cupcakes from D.C. Cupcake (from Food Network Fame) and spent the beautiful evening done by the river in the park talking and taking photos with their friends. Today, Mount Vernon, Smithsonian’s, Home. Our day, after a long night, started with a trip up to the Arboretum. It is almost 450 acres in size, and is located 2 miles from the Capitol building. Nine miles of roadways wind through and connect the numerous gardens and collections on the campus. I was surprised how much the kids liked it, even after the Clift lead hike up the hill. The arboretum functions as a major center of botanical research. It conducts wide-ranging basic and developmental research on trees, shrubs, and plants. I think everyone thought the National Capitol Columns were pretty cool. They were originally built as part of the east portico of the Capitol in 1828, long before the familiar Capitol dome was completed. However, when the dome was completed in 1866 it appeared as if it was not adequately supported by the columns, because the iron dome was significantly larger than the dome that the designer envisioned. In order to correct this visual illusion an addition to the east side of the Capitol was proposed, finally being constructed in 1958, and the columns were removed and brought here. When then headed to the capitol. I’ll spare you all the facts. However, it was very cool for first time visitors or 20th visitors. We got the outside view and took our giant panoramic photo in front of the capitol. We then went in the giant visitor center. Went under the building, saw a bunch of state statues and walked through the museum inside. We then went through the building with our tour guide and saw 3 very famous and large rooms. We’ll post photos of all of them. 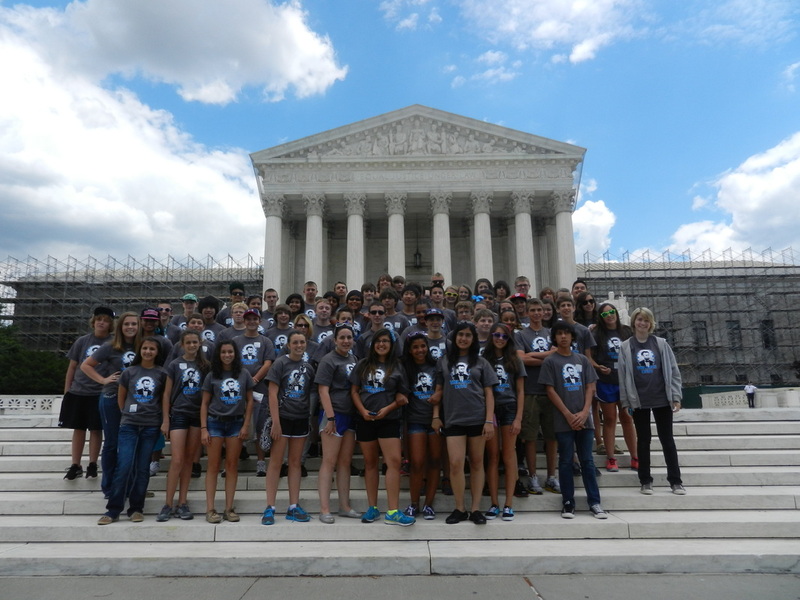 We took a quick walk through the Library of Congress and then proceeded to the front steps of the Supreme Court. After that we walked about a mile to lunch and ate all around a market and little restaurants. DC# Hotdogs were popular with many kids. We then went to the National Archives. We got to check out the Constitution, Bill of Rights, Declaration of Independence, Emancipation proclamation, and the Magna Carta. After that, we hoofed it to the Natural History Smithsonian. (Animals, Bones, Rocks, Fossils, ect.) Saw the Hope diamond. The kids thoroughly enjoyed that museum. It always is a fun one to walk around and through. Dinner, family style at buca di beppo. No one left hungry. Finished out the evening with the Einstein monument and the Lincoln memorial at night. Back at hotel at 10:30 and into bed. Gettysburg, Smithsonians, and more today. Cannot wait! Much love from D.C. Yesterday was really fun. We went to the Capital, the archives, the library of congress, and Einstein memorial. We had a great meal for dinner. Also we get to go to Gettysburg today. Your children are in excellent hands. Magen Rabatin is our head nurse and on top of handing out medications. Lynn Shelton is a photo extraordinaire and loves to interact with the kids. Heather Sims provides comic relief whenever we need it and talk me out of doing something dumb about every 4 hours. Also, be sure to check out her dance moves at the ballgame. Brittany Fannon and Matt Norris are on top of making sure we get from here to there with everyone and safely. Danny Montemayor… well, he provides… nothing of value, but we’ll keep him. No seriously, he is a just all around help in making sure the kids are seeing everything. Our tour guides Clift and Tim are awesome. I really think these are our best ever. Also, how about a shout out to our moms on the trip, Rouse, Owens, Reeves, and Bray. They are top notch. Never complain and give us extra sets of eyes. Your kids are in good hands. Things I personally learned today. 2) Never run down stairs while chasing Teddy, ankle is in pain. I think I sprained it. Ughh. In better news your kids are healthy. Alright. Here is the long and the short of today. First stop. Breakfast. Some kids were dragging pretty bad this morning, but everyone is doing fine now. We load us the buses, and head to the Jefferson Memorial. Jefferson Memorial. The Memorial's chance came in 1934 when President Franklin Roosevelt, an admirer of Jefferson himself, inquired to the Commission of Fine Arts about the possibility of erecting a memorial to Jefferson. The site of the monument is in Washington D.C. West Potomac Park, on the shore of the Potomac River Tidal Basin, is enhanced with the massed planting of Japanese cherry trees, a gift from the people of Japan in 1912. Absolutely beautiful. I’ll spare you the rest of the details. After that, we headed to the FDR Memorial. The kids aren’t as well versed on FDR since we don’t get to cover him in 8th grade, but they got the general understanding of it. Dedicated in 1997, the monument, spread over 7.5 acres and takes you through a sequence of four outdoor rooms, one for each of FDR's terms of office. Sculptures inspired by photographs depict the 32nd president alongside his dog Fala (the artist did not want to include the dog, but other wanted it). Other sculptures depict scenes from the Great Depression, such as listening to a fireside chat on the radio and waiting in a bread line, a bronze sculpture by George Segal. A bronze statue of First Lady Eleanor Roosevelt standing before the United Nations emblem honors her dedication to the UN. It is the only presidential memorial to depict a First Lady. After that, straight to the new MLK memorial. First Time I have got to see this thing. The centerpiece for the memorial is based on a line from King's "I Have A Dream" speech: "Out of a mountain of despair, a stone of hope." A 30 foot high relief of King named the “Stone of Hope” stands past two other pieces of granite that symbolize the "mountain of despair." Visitors literally "pass through" the Mountain of Despair on the way to the Stone of Hope, symbolically "moving through the struggle as Dr. King did during his life." The kids thought it was pretty neat and took a lot of photos. Next stop, the White House. We ALL got it, even though I was worried about one. Also, Brittany Fannon, formerly of Hafner name, forgot to bring an old ID, and got sequestered for a while as they got a positive ID on her. After walking through the East Room, Red, Blue, Green, State Dining room, library, and a few others, we last saw the long hallway(the one you saw when the President did his Osama Bin Laden is dead speech). Very cool tour and we could not bring cameras in, so we have no photos. Becky Williams did a project on the White House Florist for Mrs. Loftin’s class this year, and contacted her, Ms. Dowling. She called Becky yesterday and then we called her back this morning. She came out to talk with Becky, gave her a bouquet and talk to us all for a minute. I think she loved Becky, liked us, and didn’t care for Mr. Shelton. He questioned how much taxpayer money was used on flowers. Opps. National Cathedral - Absolutely beautiful. I can’t do it justice. First stone laid by Teddy Roosevelt in 1907 and finished in 1990. Our tour guides father helped build it and it buried inside. I posted pictures. This video clip is a scene from the West Wing. It has some bad language in it, as President Bartlett was grieving over losing his secretary and close friend. The clip does show how pretty this place is. http://www.youtube.com/watch?v=FScv89J6rro&feature=related It still doesn’t do juctice to the size or beauty of it. Next was to Ford’s Theatre. This was awesome. The museum, the theatre, and the Peterson house (where Lincoln died). I could go into great detail, but you know the gist of this, Lincoln went there, sadly was shot, and died across the street at the Peterson house. After that, we grabbed lunch, and headed to the Theodore Roosevelt Island. We check out the Teddy statue. I’ve never been and the kids like this little island with a Teddy statue and it felt so secluded from the rest of D.C.
After speaking with our leader, we headed to the ballgame. Game with 12 full innings. If you want a game round up, go here. The game went back and forth. We got to meet Teddy and even though we lost, we are famous with http://blog.letteddywin.com/2012/06/05/teddy-roosevelt-fans-from-hillwood-tx/ . Check it out and comment. Give Scott (he runs the site) some love for mentioning us on our trip there. Teddy came up after our chants and took some pics with us. We were on the video board 8 times by my count and several reports of us on TV. Also heard that Nat’s announcer Bob Carpenter gave us a shout out. Thanks Bob! Tomorrow. Capital Tour, Capital White House Photo, National Archives, Smithsonian’s, Supreme Court, Library of Congress. It’s 12:00 here. I’m tired, sore, and my vision is going in and out. If I have typos, deal with it. Good night all. 4:22 Am - Mrs. Sandberg is here and she prints all our tickets, SCORE! 6:10 Am - you would think I've seen about all of it, but nothing should surprise me. Girl refuses to get on plane, afraid of plane. Rabatin and Ketcham play good cop/bad cop, Montemayor plays copy's dog. After some tears, plane is loaded. 6:20 Am - loaded and taking off. 7:11am - Gavin is asleep. Chris Aguilar is drooling as he sleeps. The guy next to him looks uncomfortable. 7:31 am - can't see Mr. Shelton, but assume his is sleeping. 5:20am - Hafner and Sims get to airport. 7:25 am Pink shirt group from Decatur on flight. 11:00 am - Quinn vomits in air sick bag, everyone around her hates her j/k. We meet our first tour guide Tim. He is AWESOME. Some good humor with a mix of tons of knowledge. I am excited to have the Tim man around this week. As group one wait on group two, we spend some time at the 9/11 Pentagon memorial and the United States Air Force Memorial, that honors the service of the personnel of the United States Air Force and its predecessors. While started planning on in 1992, it was not completed until 2006. Had it been completed in 2001, the plane that hit the pentagon would of hit it instead. The three memorial spires range from 201 feet to 270 feet high and appear to be soaring; its array of stainless steel arcs against the sky evoke the image of "contrails of the Air Force Thunderbirds as they peel back in a precision 'bomb burst' maneuver." The spire structure consists of stainless steel plates with high-strength concrete filling the lower 2/3 of each spire. The upper third is hollow stainless steel. At the transition between concrete and hollow steel portions, dampers provide aerodynamic stability and dissipate wind sway energy. Need less to say, pretty cool. Group 2 meet up with us. Our 2nd guide is Clift. He is also well liked. He is sarcastic, funny, and knowledgeable. Rich wasn’t lying to me when he said he gave us the top guides this year. We grabbed a quick lunch and headed to Marine Corps War Memorial, (Iwo Jima) The memorial is dedicated to all personnel of the United States Marine Corps who have died in the defense of their country since 1775. It is bigger then I think. We had some nice pictures and saw that when you drive around it for left to right, it looks like the flag is being raised. 1. The soldier walks 21 steps across the Tomb. This alludes to the twenty-one gun salute, which is the highest honor given to any military or foreign dignitary in America. His weapon is always on the shoulder opposite the Tomb (i.e., on the side of the gallery watching the ritual). 2. On the 21st step, the soldier turns and faces the Tomb for 21 seconds. 3.The soldier then turns to face the other way across the Tomb and changes his weapon to the outside shoulder. 4.After 21 seconds, the first step is repeated. This is repeated until the soldier is relieved of duty at the Changing of the Guard. There is silence the whole time. One group, not us, yelled out. Glad I was not them. After this we went to the Lincoln Memorial, Korea, and Vietnam Memorials. We’ll check out Lincoln later this week at night, it is AWESOME to see at night. We grabbed dinner at Union station and then headed to the White House for some quick pics. I’ll be honest; I am too tired to keep going. More updates tomorrow. What we have planned for tomorrow if you are watching at home. White House 09:00, Ford’s Theatre 11:00, National Cathedral, then Ballgame. Our trip is put together by Junior Tours, they do a awesome job. http://www.juniortours.com/ Ask for Rich.